Exhibit A: Yesterday a Severe Thunderstorm Warning was in effect for Renville County, at the same time a Blizzard Warning was posted. Here's a little quarter-size hail to go with your drifting snow. Exhibit B: you may have noticed a yellow tint to the snow, courtesy of Texas dust lofted high into the atmosphere and swept over 1,000 miles downwind. Exhibit C: At the height of the storm a strong contrast in air pressure whipped up a 66 mph wind gust at St. Paul. That's 8 mph shy of hurricane force. Additional Snowfall: NAM Guidance. NOAA's 12KM NAM shows another 1-2" for the MSP metro into the morning hours Friday before snow tapers to flurries, but over 6" for a big chunk of northern Minnesota. Map: pivotalweather.com. Dirty Snow - Blame Texas. Texas dust lofted high into the atmosphere was observed as far north as Minnesota on Thursday, giving the snow a tan/yellow appearance at times. Image: AerisWeather. Late April: Warming Trend - Stormy East Coast. The 2-week outlook for 500mb winds shows a large ridge of high pressure building over the western USA with more of a moderate, Pacific flow for Minnesota - a trough of low pressure spinning up a series of sloppy storms for the eastern U.S.
Thursday Morning Radar. Snow and sleet has been reported from Colorado to the upper Midwest this morning. In parts of South Dakota, Minnesota, and Wisconsin, thunder and lightning is mixed in with this snow and sleet. The top snowfall total so far with this storm has been 18" in Mud Butte and in Dupree (both in SD). Snowfall totals of up to 4" have been reported around Denver, with snow totals between 7” and 10" reported so far this morning around the Twin Cities. Meanwhile, between a 1/4" and 1/3" of ice had been reported in Jackson, MN. April Snowstorm/Blizzard Continues Into Friday. This strong April storm will move across the mid-section of the nation over the next couple days, bringing the potential of heavy snow and blizzard conditions with it across parts of the Plains into the Upper Mississippi Valley. Snow will continue to fall at a rate of 1-2" per hour at times and blizzard conditions are expected as this snow combines with strong winds from Colorado into Minnesota. On the southern side of the heavy snow band will be an area of mixed precipitation, including sleet, freezing rain, rain, and snow, which will continue to impact areas like Sioux Falls and the Twin Cities throughout the day. Cheyenne, WY: Winter Weather Advisory through Noon for an additional 1-3" of snow and wind gusts to 40 mph. Rapid City, SD: Winter Storm Warning until Noon Thursday for an additional 2-5" of snow and wind gusts to 35 mph. Sioux Falls, SD: Winter Storm Warning through 7 AM Friday for 2-6" of additional snow and sleet, up to a quarter inch of ice, and wind gusts to 50 mph. Worthington, MN: Ice Storm Warning through 7 AM Friday for up to a half an inch of ice, an additional 2-4" of snow/sleet, and wind gusts to 50 mph. Minneapolis/St. Paul, MN: Winter Storm Warning through 10 AM Friday for an additional 3-10" of snow, ice up to a tenth of an inch, and wind gusts to 55 mph. Marquette, MI: Winter Storm Warning from 10 AM today to 2 AM Friday for 3-8" of snow, one to two-tenths of an inch of ice, and wind gusts to 40 mph. Heavy Snow Potential. The heaviest additional snow over the next couple of days will be from northern Nebraska into parts of western Minnesota, where an additional 10-20" of snow could fall in some locations. This heavy snow will continue to cause difficult to nearly impossible travel issues across the region as snow could fall at a rate of 1-2” per hour at times, which will be difficult for DOT crews (and shovelers as well) to keep up with. There will continue to be a mix of precipitation on the south side of the band of snow, where precipitation could be in the form of snow, rain, freezing rain, and sleet at times throughout the rest of the event. This area of mixed precipitation will include areas like Sioux Falls and the Twin Cities. Ice Potential. While icing will continue to be a concern from Nebraska into the Great Lakes over the next couple days, the greatest concerns will be across parts of southwestern Minnesota as well as central and northeastern Wisconsin. In those areas, that is where an additional 0.20"-0.50" of ice could fall. This ice could cause power outages and tree damage, and make travel nearly impossible due to slick conditions. 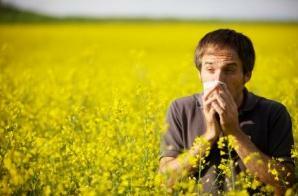 You Might Have Allergy Symptoms For The First Time This Spring - Here's Why. POPSUGAR Fitness has the post; here's the intro: "After months of bare trees and snow, Spring is a welcome change — but with gorgeous blooms come the itchy, watery, stuffy symptoms of seasonal allergies. And now, that might be true even if you've never suffered from allergies before. "Climate change is making allergies worse," Amiinah Y. Kung, MD, an allergy and immunology specialist at Northwestern Medicine Central DuPage Hospital, told POPSUGAR. "Winters aren't as cold, so there isn't much of a freeze, and with seasonal warming beginning earlier, it makes Spring particularly bad." A longer, harsher season can mean that some people develop symptoms for the first time, while others simply feel worse. Pollution also plays a role in this trend..."
Understanding Tornadoes: 5 Questions Answered as Tornado Season Arrives. Capital Weather Gang has an informative post; here's an excerpt: "...Is climate change making tornadoes bigger or more frequent? It’s hard to say. Reliable U.S. records of tornadoes go back only to roughly 1950, and records outside of the United States are even less complete. Thanks to storm chasing and the spread of camera phones, more tornadoes are counted today compared with yesteryear, but that does not necessarily mean that more are occurring. And there’s a lot of natural variability from year to year. Over the past decade, the annual U.S. tornado count has ranged from 886 to 1,690 storms per year. Estimates of wind speeds based on post-storm damage surveys can be off by 50 percent or more. And many tornadoes in remote areas leave no clues as to how strong their winds were..."
"Pollenpocalypse" in North Carolina. I can't say I recall ever seeing anything quite like this. CNN has the story: "#ThePollening. It sounds like an M. Night Shyamalan horror film. If you suffer from pollen allergies, just looking at the above photo may make you want to choke. It was taken Monday by photographer Jeremy Gilchrist, who used a drone to snap aerial pictures of the yellowish green haze blanketing Durham, North Carolina. The pollen wasn't just coating cars and patio chairs -- it was hanging thick in the air. He called it #pollenpocalypse. Gilchrist told CNN he was driving around when he noticed a green cloud in the air. "It was surprising to see it up that high," he said. He's seen pollen shrouds like this before in North Carolina, but from the ground it's difficult to capture their sheer magnitude. So he sent up his drone to a get a better vantage point..."
Photo credit: "Photographer and storm chaser Jeremy Gilchrist captured aerial images of a pollen cloud hovering over Durham, North Carolina." The U.S. Is The Unhappiest It's Ever Been. I'll bet people were more unhappy during the Civil War - just a hunch. Here's a clip from Fortune: "The United States is the unhappiest it’s ever been. The 2019 World Happiness Report says that Finland remains the happiest country on Earth for the second year in the row, while the U.S. drops to No. 19, its worst ranking ever (it was No. 18 in 2018 and No. 14 in 2017). The global report on 156 countries released Wednesday placed five Nordic countries in the top 10, with the Netherlands (5), Switzerland (6), New Zealand (7), Canada (9), and Austria (10) filling out the other top spots. At No.15., even the Brexit-divided United Kingdom ranked higher than the U.S..."
11 Things You Shouldn't Do On a Plane. Thank you USA TODAY for spelling this out; here's an excerpt: "...I have no problem with people slipping off their shoes to be more comfortable on a long flight – with a few important exceptions. First, your feet should be as unobtrusive as possible to everyone else (so don’t prop them on top of a seatback, or wriggle them into the gap between the wall of the plane and the poor person in the seat in front of you who just wants to lean against the window without getting a faceful of your bare toes). Second, put your shoes back on before you go to the lavatory (because ew). And finally, if you know you’re prone to bromodosis – the polite scientific term for smelly feet – be considerate of your fellow passengers and leave your shoes on..."
Don’t Shoot! Daily Beast has an amusing tale: "When a terrified Oregon woman heard weird noises and saw shadows coming from her locked bathroom, armed officers were called in and they prepared to break down the door to neutralize the suspect. Deputies surrounded the house, brought in a canine unit and shouted to the suspect to exit the bathroom or face the consequences. The cops heard “rustling” noises, USA Today reports, which became more frequent as they continued to shout instructions to their suspect. But when the door remained closed for 15 minutes, they burst in with their guns drawn—and found a Roomba. The Washington County Sheriff's Office said in Facebook post Tuesday that officers discovered a “very thorough vacuuming job being done by a Roomba Robotic Vacuum cleaner.” Good job, everyone..."
Amazon's Growing Ties to Oil Industry Irks Some Employees. ABC News reports: "Amazon is getting cozy with the oil industry — and some employees aren't happy about it. The online shopping giant, which already works with BP and Shell, has been trying to woo more oil and gas companies to use its technology to help them find drillable oil faster, angering workers who have been pushing Amazon to do more to combat climate change. The employees say the company should drop its work with industry entirely, arguing that it shouldn't contribute to hurting the environment. Workers at Amazon's Seattle headquarters have been meeting regularly, spreading the word and encouraging more involvement to put pressure on the company..."
File photo credit: "In this Aug. 3, 2017, file photo, an Amazon employee applies tape to a package before shipment at an Amazon fulfillment center in Baltimore. The online shopping giant, which already works with BP and Shell, has been trying to woo more oil and gas companies to use its technology to help them find drillable oil faster, angering workers who have been pushing Amazon to do more to combat climate change." (AP Photo/Patrick Semansky, File). The Next Reckoning: Capitalism and Climate Change. Can a market-driven economy come up with the solutions we need to lower carbon (faster) without heavy-handed government intervention? Here's an excerpt from a New York Times article: "...The most fundamental question is whether a capitalistic society is capable of sharply reducing carbon emissions. Will a radical realignment of our economy require a radical realignment of our political system — within the next few years? Even if the answer is no, we have some decisions to make. How, for instance, should the proceeds of a carbon tax be directed? Should they be used to finance clean-energy projects, be paid out directly to taxpayers or accrue to the national budget? In a healthy democracy, you could expect a rigorous public debate on this question. But such a debate has rarely surfaced in the United States because, as of this writing, only a handful of Republican members of the House of Representatives, out of a caucus of 197, have endorsed the basic concept of a carbon tax — an idea that has its roots in conservative economic thought..."
An Ancient Ice Core May Show 1.5 Million Years of Climate History. Until now most of the ice core samples from Antarctic and Greenland go back closer to 800,000 years. 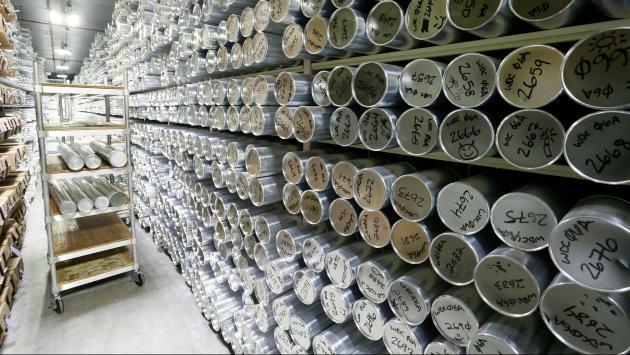 Quartz has details: "Selecting the right spot for ice-core drilling is a difficult pursuit. And after three years of searching with radar and on-the-ground sampling, an international team just struck gold: They found a spot on Antarctica where the ice is thick enough to reveal 1.5 million years of climatic history. It will take another three years to drill down that far. Ice cores reveal what the climate was like on Earth throughout time. Air bubbles trapped in the ice can be sampled to measure how much carbon, methane, and other gases were in the atmosphere at the moment the ice froze. A single meter-long piece could contain 10,000 years of climate history, if selected carefully. 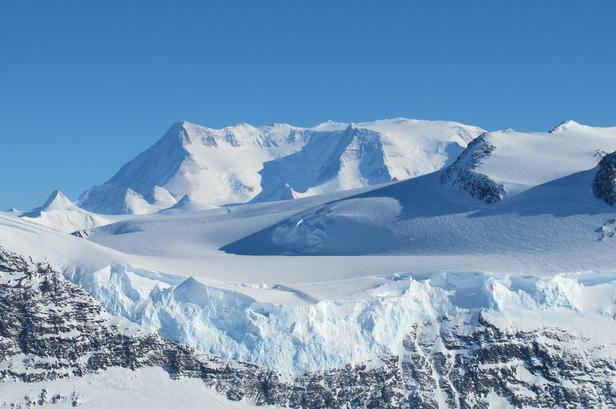 And the deeper the ice core, the farther back in time the samples can go..."
Photo credit: "Reaching the oldest ice ever drilled will take three years." AP Photo/Brennan Linsley. From Ruined Bridges to Dirty Air, EPA Scientists Price Out The Cost of Climate Change. The Los Angeles Times reports: "By the end of the century, the manifold consequences of unchecked climate change will cost the U.S. hundreds of billions of dollars per year, according to a new study by scientists at the Environmental Protection Agency. Those costs will come in multiple forms, including water shortages, crippled infrastructure and polluted air that shortens lives, according to the study in Monday’s edition of Nature Climate Change. No part of the country will be untouched, the EPA researchers warned..."
Photo credit: "Orange County public works crews use heavy machinery to remove a damaged boardwalk at Capistrano Beach in Dana Point. Damage to coastal property is one of the greatest costs of climate change." (Allen J. Schaben / Los Angeles Times). The Weather Channel Flooded Charleston to Make You Give a Damn. WIRED.com explains the use of special effects to tell the climate story: "...The report starts by placing meteorologist Jen Carfagno in the year 2100, where rising sea levels have left the city of Charleston, South Carolina, broadly, perpetually flooded. It then cuts to present-day Norfolk, Virginia, home to the largest naval base in the US, where that same crisis plays out on a near-annual basis. Finally, it hurtles back to 1851, showing just how much ice the famed Jakobshavn glacier has shed over nearly two centuries. Together, the three portions present a look not just at the future of climate change, but its present and past, a three-pronged effort to shake viewers out of their malaise..."
"Flight Shame" Has Swedes Rethinking Air Travel. Then again, Sweden (and just about all of Europe has something the United States doesn't have: clean, dependable, high-speed rail). Here's a clip from france24.com: "Saddled with long dark winters at home, Swedes have for decades been frequent flyers seeking out sunnier climes, but a growing number are changing their ways because of air travel's impact on the climate. "Flygskam", or flight shame, has become a buzz word referring to feeling guilt over the environmental effects of flying, contributing to a trend that has more and more Swedes, mainly young, opting to travel by train to ease their conscience..."
Photo credit: "It turns out Swedes have a word for guilt over the carbon footprint of air travel." AFP/File.